Hello! Our apologies for the problems. Less than 1% of users experience problems with our handwriting program, however, we should be able to solve your problem here so you can begin using this powerful handwriting practice tool. Please look at the solutions below and one should get things up and running, otherwise, please let us know. 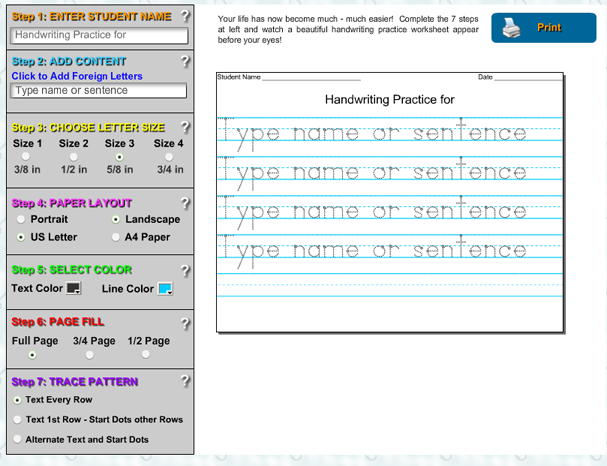 First, a program called Flash Player must be installed on your computer to run our Handwriting Program. You must also have Flash Player Version 9 or newer for things to work correctly. Older versions of Flash player will not work. If all you see is an "X" to the right of the advertisement on the main page (or if you see the program but it doesn't work properly), the first thing we should try is downloading the latest version of Flash. Do this by going now to www.adobe.com/flashplayer - to upgrade to the newest version of Flash Player. If this doesn't solve the problem come back to this page and try the steps below. When all else fails - reboot. Some users have said they are unable to enter text into the input boxes for Step 1 and Step 2. This has been solved by turning teh computer off and then back on. If you have tried the 3 suggestions above and still have problems, please let us know. If you do this we would be glad to give you free passwords to our new Penmanship Pro handwriting program that features a larger screen and more features. The Handwriting Worksheet Maker Crew!